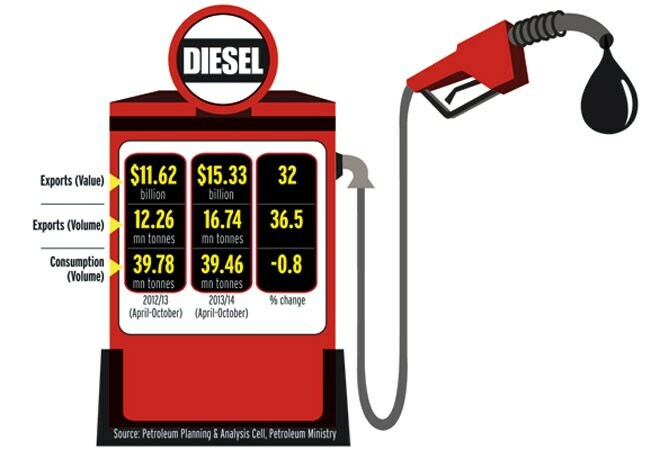 As diesel prices rise, domestic sales fall while exports surge. Slowing domestic demand for diesel and a weakening rupee are helping boost exports of the fuel. Diesel exports have climbed 32 per cent in the first seven months of the fiscal year that began in April to more than $15 billion, government data show. In rupee terms, exports soared 44 per cent to Rs 91,408 crore in the April-October period as the local currency fell against the US dollar. Exports in volume terms surged 36.5 per cent. This led to a rise in the share of diesel in India's petroleum exports to 42 per cent in value terms for the April-October period from 36 per cent last fiscal year. Domestic consumption has fallen 0.8 per cent in the April-October period to 39.46 million tonnes. This is due to factors like regular price increases and a bumper monsoon that helped farmers cut dependence on diesel generators for irrigation. Local consumption of diesel had been growing at six to eight per cent over the past few years due to various factors, including stable pricing as the government subsidises the fuel. Deepak Mahurkar, Director and Leader-Oil and Gas at consulting and accounting firm PwC India, says diesel exports are growing because of stagnant local demand and higher supply from export-oriented refineries. "Domestic demand growth is expected to catch up despite increasing prices if economic activity picks up or owing to seasonal and incidental developments like elections and farming," he says. According to the Petroleum Planning and Analysis Cell, the data wing of the petroleum ministry, domestic consumption has fallen because of price increases, slowing sales of commercial vehicles and a better power situation. A shift by some industrial consumers to alternative fuels after the government allowed dual pricing of diesel is also hurting local consumption. 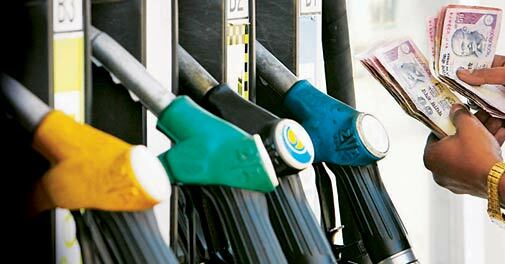 Since April, diesel prices have risen 10 per cent to Rs 53.67 a litre in Delhi. Regular increases are likely in coming months as the government attempts to bring down refiners' revenue losses on the fuel. Oil companies currently lose Rs 9.99 on every litre of diesel. An industry executive attributed the increase in exports to a rise in output as operations in new refineries at Bathinda in Punjab and Bina in Madhya Pradesh have stabilised. The executive, who does not want to be named, added that both Essar Oil and Reliance Industries are likely exporting more diesel this year.